Who is not a little fatigued these days? Life in general can make us tired. Home, work, family and life itself are stressful. We run here and there and we are TIRED. Everyone knows their "tiredness threshhold". But what happens when fatigue crosses that threshhold? When tiredness becomes overwhelming? When you can no longer get through your day? 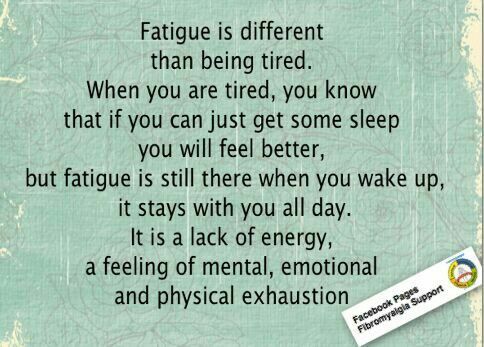 Fatigue is defined as a lack of energy or motivation and can be physical, mental or a combination of both. Normal tiredness should be differentiated from organic fatigue. Normal tiredness should dissipate with a day or two of rest. Organic fatigue will linger, despite rest. 13. Shift Work. Shift work causes a disruption in your diurnal rhythms, which can cause fatigue. Make sure your workplace is bright and your sleep space is dark. Try to keep a sleep-wake schedule to minimize diurnal confusion. 14. Chronic Fatigue/Fibromyalgia. These conditions cause chronic, unexplained fatigue. The best treatment for CFS/Fibro, is regular, scheduled sleep, light exercise daily and a whole foods diet to decrease inflammation. 15. Lung Disease. Lung disease can cause fatigue because it is associated with impaired oxygen exchange. 16. Vitamin deficiency. A deficiency in Vitamin B12 or magnesium can cause fatigue. 17. Adrenal Fatigue. Adrenals are glands in your body that regulate hormones. When they become stressed, cortisol levels rise and fatigue sets in. So now you know WHY you are fatigued, but what can you do about it? Avoid processed foods and sugars which cause inflammation in the body. Inflammation causes fatigue. You can supplement with B vitamins, pantothenic acid, Vitamin C and Magnesium. Melatonin may help you sleep. Also, as we get older, mitochondrial function decreases; supplementation with L carnitine can help. 1. Not getting enough sleep. It needs to be said. Our bodies need 7 to 8 hours of sleep a night. Any less can cause a chronic sleep deprivation state and fatigue. Try to go to bed and wake up at the same time every day. This sets up a good sleep habit and it will make it easier to fall asleep and stay asleep. 2. Sleep Apnea. The most common reason for day time fatigue in obese people is sleep apnea. Sleep apnea is when people stop breathing while they sleep. Obesity, smoking and alcohol consumption are all risk factors. 3. Eating too little or eating the wrong foods. Not eating enough protein, or eating too many sugary and processed foods can cause a spike, then drop, in blood sugar which makes you feel fatigued. 4. Iron deficiency anemia. Red blood cells contain iron and carry oxygen throughout the body. If you don't have enough red blood cells, or too little iron, your body's circulating oxygen is compromised. Your healthcare provider can do a simple blood test to check for this. If you have iron deficiency anemia, make sure you eat iron rich foods like beef, dark green leafy vegetables, sunflower seeds, nuts and beans. 5. Depression. Depression can cause fatigue, insomnia and many other vague symptoms. If you think you are depressed, seek medical help immediately. 6. Hypothyroidism. Your thyroid gland regulates your metabolism. If it is not working correctly, it can cause fatigue. Your healthcare provider can do a simple blood test to check for this. 7. Caffeine withdrawl. Drinking caffeine gives you a nice boost, but the crash when it wears off can leave you fatigued. 8. Urinary Tract Infection. A urinary tract infection (UTI) can cause fatigue and weakness, especially in the elderly. Your healthcare provider can check your urine to see if this is the cause. 9. Diabetes. Sugar causes inflammation in the body. Inflammation can cause fatigue. You may have too much sugar in your blood. A simple blood test can check for this. 10. Dehydration. Dehydration can make you feel tired and weak. Water or coconut water are great choices to quench your thirst. 11. Heart Disease. Are you feeling fatigued suddenly while doing every day activities? Your heart may be to blame. If your heart is not functioning properly, it can make you fatigued, even when you think you shouldn't be, like when while climbing stairs or shopping. Contact your healthcare provider if you think your heart may be causing your fatigue. 12. Food Allergies. Food allergies cause inflammation in your body, which causes fatigue. If you think the foods you eat are causing your fatigue, you can do an Elimination Diet. Eliminate the offending food for 2 weeks, then add it back in and note the change in how you feel. 1. Preheat oven to 180°F. 2. Chop Brazil nuts and pecans in a food processor. Mix in a bowl with all the other nuts, seeds, and coconut flakes. 3. Combine melted coconut oil, maple syrup, vanilla extract, and cinnamon. Pour into the dry ingredients and mix until everything is well-coated. 4. Place in the oven to cook for 30 minutes. This granola is rich in healthy omegas, magnesium, selenium and coconut fats which are needed for healthy brain, hormone, and cell function.